If you have fuzzy selections (fur, hair, or leaves, for example) or you’re having difficulty using the selection tools in Adobe Photoshop CS6, the Quick Mask tool can be a huge help because it allows you to paint your selection uniformly in one fell swoop. To enter Quick Mask mode, create a selection, and then press Q. (Pressing Q again exits you from Quick Mask mode.) You can also click the Quick Mask button at the bottom of the Tools panel. In Quick Mask mode, Photoshop shows your image as it appears through the mask. The clear part is selected; what’s covered in the mask isn’t selected. 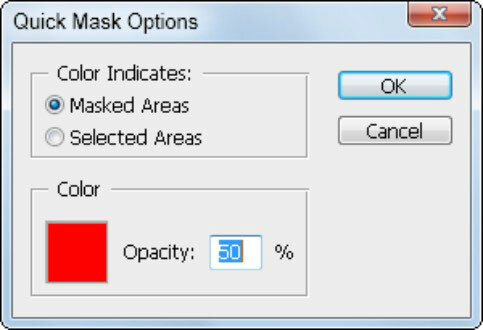 Change the default red color of the mask by double-clicking the Edit in Quick Mask Mode button (at the bottom of the Tools panel). The tooltip says Edit in Standard Mode if you’re already in Quick Mask Mode. This opens the Quick Mask Options dialog box. Press D to change the foreground and background color boxes to the default colors of black and white. Select the Brush tool and start painting with black in the clear area of the image in Quick Mask mode. It doesn’t have to be pretty; just get a stroke or two in there. Press Q to return to Selection mode. You’re now out of Quick Mask mode. Notice that where you painted with black (it turned red in Quick Mask mode), the pixels are no longer selected. Press Q again to reenter Quick Mask mode, and then press X. This step switches the foreground and background colors, giving you white in the foreground and black in the background. With the Brush tool, paint several white strokes in the red mask area. The white strokes turn clear in Quick Mask mode. The area you painted white in Quick Mask mode is now selected. When you’re in Quick Mask mode, you can paint white over areas you want selected and black over areas you don’t want selected. When painting in Quick Mask mode, increase the brush size by pressing the ] key. Decrease the brush size by pressing the [ key. In Selection mode, your selection seems to have a hard edge; you can soften those hard edges by using a softer brush in Quick Mask mode. To make a brush softer, press Shift+[. To make a brush harder, press Shift+]. Because Quick Mask mode makes selections based on the mask’s values, you can create a mask by selecting the Gradient tool and dragging it across the image in Quick Mask mode. When you exit Quick Mask mode, it looks as though there’s a straight-line selection, but the selection transitions the same as your gradient did. Choose any filter from the Filters menu and notice how the filter transitions into the untouched part of the image to which you applied the gradient. If you’re working in Quick Mask mode, choose Window→Channels to see that what you’re working on is a temporary alpha channel.